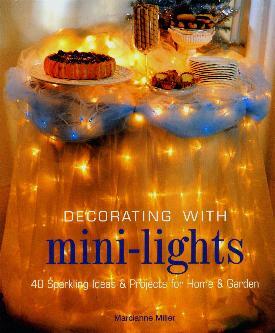 I find mini-lights rather enchanting and they instantly create an atmosphere. The best thing is that they don't only have to come out during the Christmas season. I have mini-lights framing a doorway year-round. Marcianne Miller has put together this wonderful book which is full of great ideas to emulate. The first picture on page 6, completely changes the affect on a decorative gift table. Nowadays you are spoiled for choice as there are so many varieties to choose from: traditional string of white, multi-color or one-color strings; night-light size; icicle strings in different colors; little candles; flashing lights, and so much more. Some featured here I've not seen before but apparently the Internet is a good source. Apart from the ones with little "shades", I found all of the features appealing - I'm not a very crafty person. I particularly liked "Starry Stairway", the "Star-kissed Bower" (what a great idea), the two fire-place decorations, the "Too-fun Ficus", the "Majestic Grape Arbor" (the setting is important - designs too dissimilar to the one featured might not look as good), the "Light Shower Parasol" (great for outside the door to welcome guests), and the gorgeous patio umbrella. Ideas I truly loved were the flowers in silver buckets - I didn't know you could get mini-lights in the shape of flowers - a good alternative for table decorations, especially for those who cannot tolerate flowers or pollen. Switching on these arrangements each night adds a peaceful ambiance and can be very relaxing. Beats stinky candles. It goes without saying that some designs will make your party that much prettier. Keep your lights in one place, along with spare bulbs, extension cords, and instructions. Don't complicate your life - these little things are happy things in one's life. Read the safety text - it's important. I like the idea of using a timer on the lights in case you forget to turn them off at bedtime. Everything about these mini-lights is mini - they're tiny, cost-effective, inexpensive (buy boxes of marked down lights that go on sale after Christmas) but the drama is priceless. Be careful not to overdo things and make your home look like a circus. Conclusion - I LOVE this book! Extremely good ideas and a steal at the price.